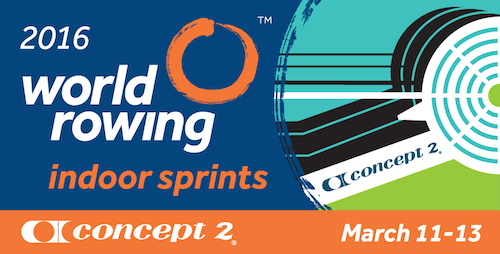 The World Rowing Indoor Sprints are a new initiative between Concept2 and World Rowing. The Sprints are a virtual indoor rowing championships modeled after the successful SkiErg World Sprints. The Indoor Sprints takes place between March 11-13, 2016. As to where it takes place—that's entirely up to you! Unlike a traditional race, the World Rowing Indoor Sprints can take place anywhere in the world. You can take part on your own or in an organized event. We're excited to see how widespread this gets! Race 1,000 meters on the Concept2 Indoor Rower (Model A-E rowers only, no Dynamic or indoor rowers on Slides) at your club, gym, school or home March 11-13, 2016. Individuals should enter their time in their Concept2 Online Logbook by 9 a.m. GMT on March 15, 2016. Events should send their results by email to ranking@concept2.com using the result form below. If you submit 20 or more individual results from an event held by your club or team, you’ll be entered in a raffle for a new indoor rower for your facility. Results must be emailed by 9 a.m. GMT on March 15, 2016. There will also be a separate raffle for events held in World Rowing development countries where there are 10 or more competitors. Email sheila.stephens@fisa.org if you have a question about whether your country qualifies. Late submissions cannot be accepted. All results MUST be submitted by 9 a.m. GMT on March 15, 2016.